After being on GAPS for awhile, I became much more aware of the ingredients in the foods we ate – yes, I even began reading labels! One of the things that struck me (besides sugar being on every label I read!) were the oils used in prepared foods – they were down right bad for you. Canola oil and partially hydrogenated oils are in just about everything! So, I began the quest to replace as many bad-for-you oils in our diet with good-for-you oils. 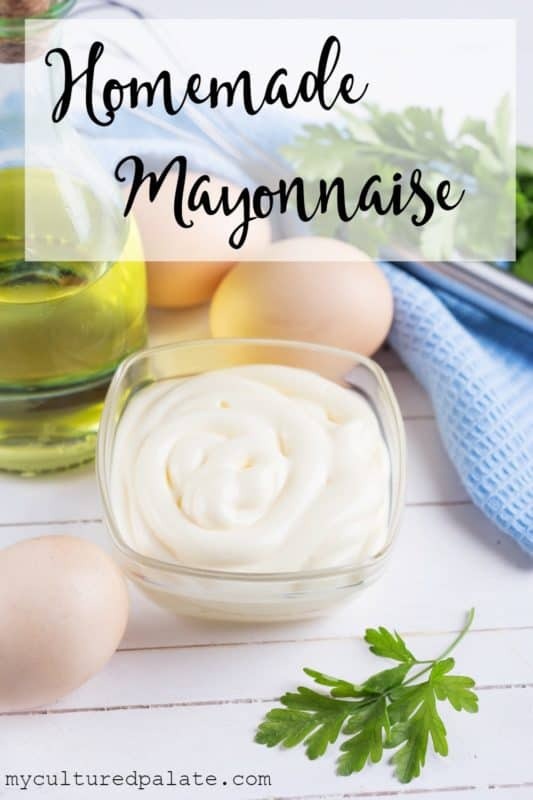 Enter – Homemade Mayonnaise! In the following video, you will see just how easy making your own homemade mayonnaise is to do. And, you will wonder why you never tried it before! After all, it is richer, creamier, full of enzymes and just plain tastes good! Following the video, there is a resource section of the things I use in the video and a recipe for those of you who prefer written instructions. These are things you see me using in the video and link to the exact item – I don’t know about you, but I love knowing what other people are using and why they like them. The links will take you to amazon. Using a food processor makes the blending of the oil a breeze. I use this Cuisinart processor and have for about 4 years now. I can’t say enough about it because it has held up wonderfully for me and the use I give it with our family size! Olive Oil – I have used extra virgin olive oil and virgin olive oil. Virgin olive oil has a milder taste and extra virgin is stronger. You will have to experiment with the one that you prefer. Lemon Juice – I like to use real lemon juice that comes in a bottle. I have tried squeezing my own lemon juice from lemons but since I do not normally keep lemons, the bottle is more convenient. You may be a bit squeamish as you look at the recipe which calls for an egg – raw egg, that is. Since we have chickens, I am sure the eggs are fresh and I encourage you to find a local source for pastured eggs. Raw eggs are safe and very healthy for you when they are pastured. In the GAPS diet, raw egg yolk is introduced during the second stage because they are easily digested and absorbed quickly. Eggs provide wonderful nutrition! In the blender or food processor, whisk the egg. In a slow and steady stream, add the olive oil.